How few have ascended the heights thou hast trod! Marietta Walker printed these lines in Autumn Leaves— the young adult literary journal she founded and edited—two years before donating a 20 acre plot of land in southern Iowa for the construction of Graceland College. Walker, who became one of the college’s first instructors, was already a prolific author in the blossoming literary scene of fin de siècle Lamoni. In the verse above, a tribute to J.G. Whittier, Walker stressed the core values she shared with the abolitionist bard—social justice and spirituality—and on which Graceland College and her poetry were established. As a resident of nineteenth century letters, Walker believed deeply in the ethical significance of verse. Poetry had reigned for centuries as a tool of public debate and commemoration, imbued with the power to direct readers to moral contemplation and action. Walker hoped that poetry might then instill a love of liberty and self-examination in Graceland’s student body and the region’s population at large. More than a century later, Graceland and Lamoni remain uniquely positioned, as a higher learning institution and a civic-minded municipality, to renew Walker’s pledge to develop poetry as an ethical and social guide for the community. My initial proposal, to implement a collaborative “public poetry” project, was a small step towards those mighty heights. With year one in the books, it’s time to appraise the final product, the Graceland University Poetry Day project! It was last fall—while on a morning stroll around campus—that my colleague Daniel Platt and I began conjuring up ways that two freshly-minted literature professors might make an impact beyond the classroom, in our new communities. Mindful of Graceland’s track record of service learning success, we were eager to embrace the role of liaisons and tap into the rich store of literary imagination in the Iowa-Missouri borderlands. That autumn walk spawned a springtime creative writing project that brought English majors together with local high school students to read, write, recite, and discuss poetry. The campaign culminated in the university’s inaugural “poetry day” on April 7th, a tribute to National Poetry Month. Poetic hand gesturing in Cainsville. L to R: me, Matt Moore, Linda Buckingham. Starting in January, I met regularly with English student volunteers–Matthew Moore, Linda Buckingham, Lexi Cairns, Jessica Pycior, Ryan Schlom, and Tabi Miller–to develop lesson plans on poetic history, form, and craft. We made a loose list of “big ideas” about the genre we thought important to cover. So by leaving the actual content of the lessons open-ended, each student was able to bring her/his unique interests and skill set to bear. Our environmentalist taught Mary Oliver, the resident feminist critics took on Lynn Emanuel, a student after my own heart chose Walt Whitman. All excelled, no matter the poem. With the cooperation of instructors and administrators, the group visited classes at Lamoni, Mount Ayr, and Decatur Central high schools in Iowa, and Cainsville, Ridgeway, North Harrison, and South Harrison high schools in Missouri to promote the event. The project received generous financial and logistic support throughout from Graceland University, TRiO Educational Talent Search and The Dekko Foundation. On the big day, dazzling workshoppers with a whiteboard example. 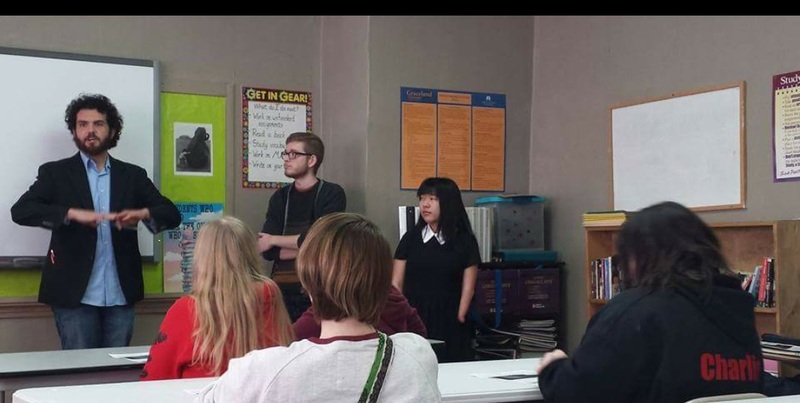 Thirty students pursued the project to its end, working with the Graceland assistants through the spring to write and revise poems for the keynote event in Lamoni. 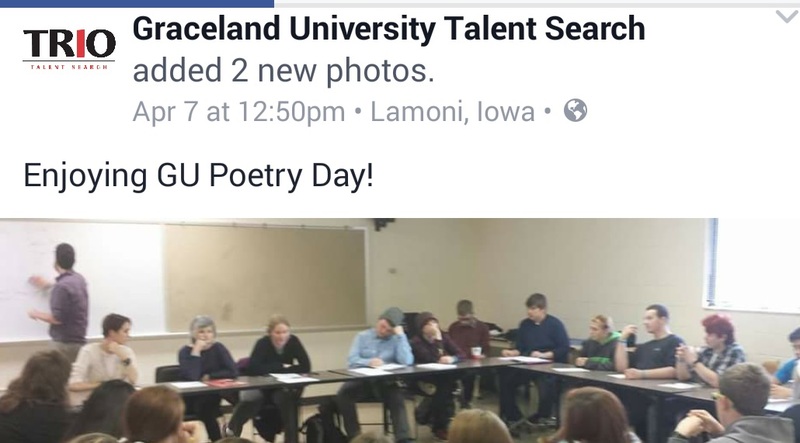 Graceland University Poetry Day featured a master writing workshop, scholarly discussions, and several rounds of impromptu poetry performances! All attendees will have their final poems printed in a special edition of Graceland’s literary magazine, The Vespiary, this coming fall, in addition to receiving creative writing scholarships to attend the university in the future. The Graceland University Poetry Day project—founded at the intersections of public scholarship and civic engagement—will continue collaborating with local communities this fall! The 2017 event is set to expand in scope to reach even more high schools and engage even more students from the region.